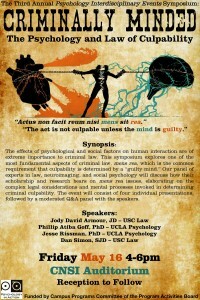 Psychology in Action is proud to announce the third annual Psychology Interdisciplinary Events symposium, Criminally Minded: The Psychology and Law of Culpability, to be held Friday, May 16th, 2014, from 4 to 6pm in UCLA's CNSI Auditorium. The discussion will focus on legal and psychological issues regarding mens rea. The event is completely FREE and open to the general public! We hope to see you there! The effects of psychological and social factors on human interaction are of extreme importance to criminal law. This symposium explores one of the most fundamental aspects of criminal law, mens rea, which is the common requirement that culpability is determined by a “guilty mind.” Our panel of experts in law, neuroimaging, and social psychology will discuss how their scholarship and research bears on mens rea issues, elaborating on the complex legal considerations and mental processes invoked in determining criminal culpability. The event will consist of four individual presentations, followed by a moderated Q&A panel with the speakers.